Datura double purple, the Horn of plenty or the Downy thorn apple, is a member of the Soanaceae, or nightshade family. It grows 3 or 4 feet tall and origins of Central America. More compact in container. 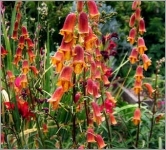 Normally treated as an annual, the plant can be over-wintered in a greenhouse environment. A very beautiful, very interesting looking plant. 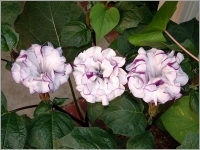 Frilly, double, midnight-purple fluted horns or trumpet flowers, with white interiors burst open in profusion throughout the Summer, commonly 12-18 cm long. Very fragrant at night and a good part of the morning. The plants will start flowering when they are about a foot tall.